In this article we will show you, How to write a C Program to Copy an Array to another array with example along with detailed explanation. This C program allows the user to enter the size of an Array and then elements of an array. Using For Loop in C Programming, we are going to copy each and every element to second array. 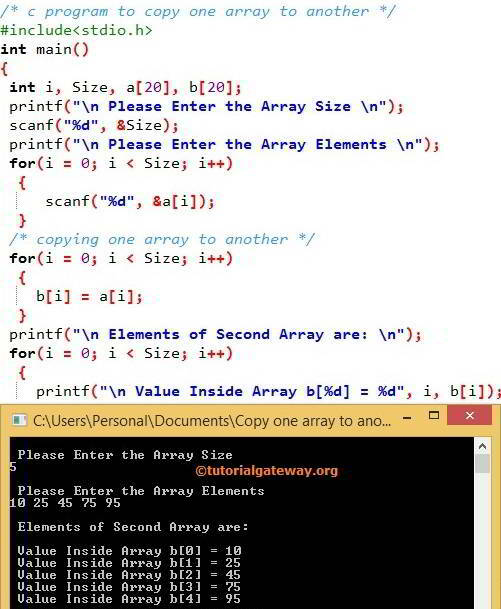 In this Program, We declared 2 arrays a, b with the size of 20. Below printf statement asks the User to enter the array a size (Number of elements it can hold). Below scanf statement will assign the user entered values to Size variable. Below for loop will helps to iterate each and every cell present in the a array. Condition inside the for loops (i < Size) will ensure the compiler, not to exceed the array limit. In the next line, We have one more for loop to copy an array to another array. The value of i will be 1 and the condition (i < 5) is True. So, it will start executing the statements inside the loop until the condition fails. The value of i will be 2 and the condition (i < 5) is True. So, it will start executing the statements inside the loop until the condition fails. The value of i will be 3 and the condition (i < 5) is True. So, it will start executing the statements inside the loop until the condition fails. The value of i will be 4 and the condition (i < 5) is True. So, it will start executing the statements inside the loop until the condition fails. After the incrementing the value of i, i will become 5 So, the condition (i < Size) will fail. So it will exit from the loop. Next for loops, Will traverse as we explained above but instead of copying the elements it will display the values one by one using the printf statements inside them.